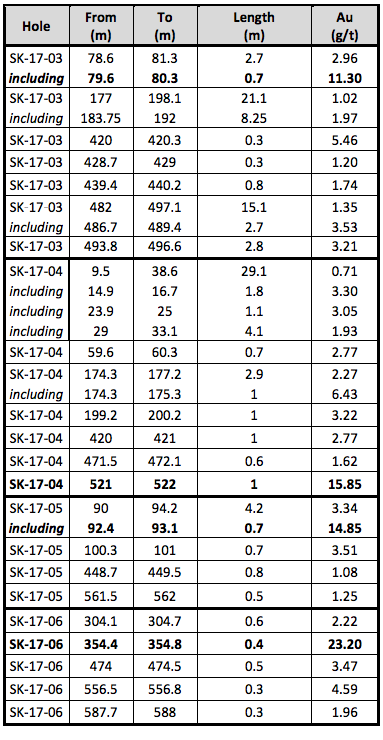 Montreal, Quebec, Canada, August 16, 2017 – MONARQUES GOLD CORPORATION (“Monarques” or the “Corporation”) (TSX-V: MQR) (FRANKFURT: MR7) is pleased to report the results for the 2,500-metre drilling program on its Simkar Gold property, located approximately 20 kilometres east of Val-d’Or, Quebec, and less than 3 kilometres from the Company’s Beacon Gold mill (see map). The widths shown are core lengths; true width cannot be estimated. The technical and scientific content of this press release has been reviewed and approved by Vincent Jourdain, Eng., Ph.D. Mr. Jourdain is employed by MRB & Associates and is a qualified person under National Instrument 43101. Sampling normally consisted of sawing the core into two equal halves along its main axis and shipping one of the halves to the ALS Minerals laboratory in Val-d'Or for assaying. The samples are crushed, pulverized and assayed by fire assay with atomic absorption finish. Results exceeding 3.0 g/t are re-assayed using the gravity method, and samples containing gold grains are assayed using the metallic sieve method. Monarques uses a comprehensive QA/QC protocol, including the insertion of standards, blanks and duplicates. Monarques Gold is a growing junior gold company focused on becoming the leading explorer and developer of gold properties in the Val-d’Or/Abitibi gold camp in Quebec, Canada. 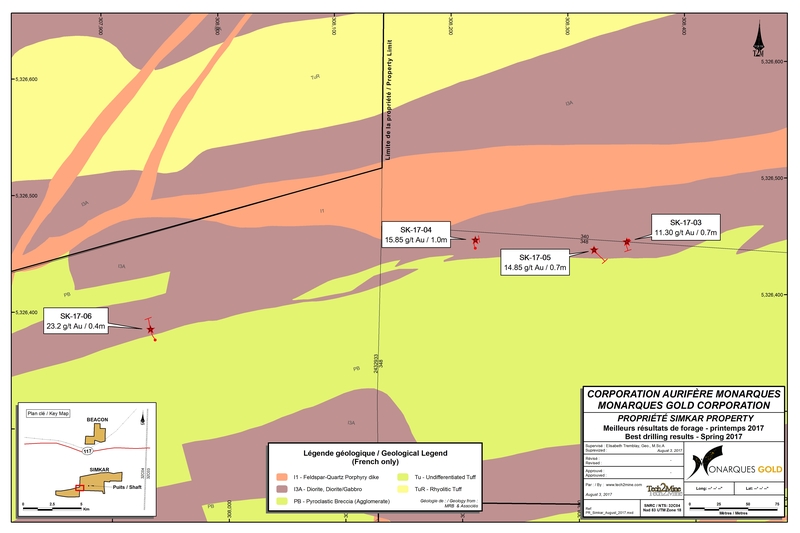 The Corporation currently has approximately 200 km² of gold exploration properties (see map) along the Cadillac Break, as well as its main asset, the Croinor Gold mine, which has great potential to become a producing mine. Monarques Gold is well financed and has close to $9 million in credits from Quebec’s Ministry of Energy and Natural Resources.